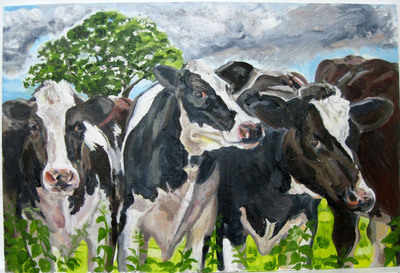 Giclee print of a painting in oils of cows in Dorset on Hahnemuhle Bamboo 290gsm paper (90% natural bamboo fibre). The image measures 282mm x 420mm with an inch of white border. I painted this picture from a photograph taken while holidaying in Dorset. We we were staying in a lovely house in the beautiful town of Beaminster that had a field of cows next door and whenever we were in the kitchen, which overlooked the field, the nosy creatures would come to the fence and have a good stare at us! They were quite intimidating.